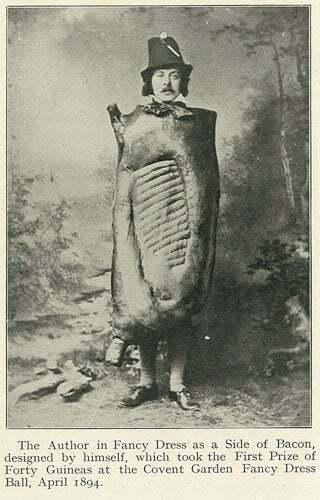 In the introduction of his seminal 1917 pork products treatise Bacon and Hams, author and smoked swine maven George J. Nicholls included this photo of himself "in fancy dress as a side of bacon." The costume was so smashing that it won him no less than forty guineas. All men have an interest in bacon, with the exception, perhaps, of the Jew and the vegetarian; and the man of little imagination, but of sound appetitive instincts, who had bacon and eggs for breakfast one morning, and varied monotony by ordering eggs and bacon the next, was more than justified by the almost unanimous vote of the community –- the pig, with some assistance from the hen, is the true autocrat of the breakfast table! Funny, I always assumed that royal descriptor was reserved for Count Chocula. For further adventures in bizarre old-school cosplay, see the 1873 Charles Darwin-themed Mardi Gras parade.